Marvin Dixon was born in Evanston, IL and raised in Miami, FL; Now he commutes between Atlanta and Miami. He has been performing and hosting comedy since 1994. 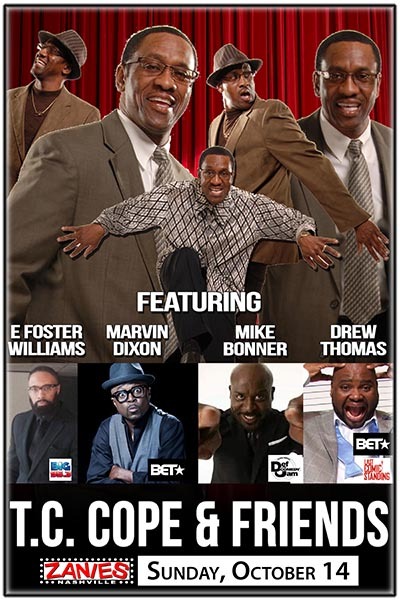 Since doing comedy he has appeared on HBO Def Comedy Jam, BET Comic View and most recently "The Tom Joyner Skyy Show". He has also appeared in numerous videos and movies (Trois II-Pandora's Box & Bloodline), he has a DVD comedy series which he hosted, called "The Young Gunz of Comedy" to be in stores coming soon. He is a former radio morning show host on one the hottest stations in Miami. He host and performs on many main event stage shows including Zo's Summer Groove and The Ray Lewis Foundation Annual Event (Ray's Summer Days). Not only is Marvin a great comedian, but his also a great promoter. His annual Event is "The Miami Nites Reunion Show" from which he started. The comic stylings of Drew Thomas are a hilarious portrayal of comedic storytelling. He draws his audience in with his accounts of relationship follies and keen retorts on everyday life and current affairs. Drews insight on comedy leaves you with a sense of intimacy that makes women want his number; guys want to grab a beer with him and everyone laughing all night. His warm and inviting personality puts you at ease and makes you comfortable instantly; you are immediately drawn into his world as he takes you on a comedic roller coaster ride. Drews quick wit and smooth delivery are the perfect combination for laughing out loud. Drew was born in Jamaica, raised in the Bronx, NY and is currently living in Atlanta. Hes been honing his craft at some of Atlantas top comedy spots, The Punchline, Twisted Taco, Star Bar, and Funny Farm. He has left many nights as the only comedian to blow up the stage and receive continuous standing ovations. He is currently the Host of Phat Comedy Tuesdays @ Twisted Taco where he is the main attraction. He has featured and headlined at numerous comedy clubs, colleges and universities and special engagements. Some of the people Drew has graced the stage with, include Ron White, Jake Johansen, Don DC Curry, D.L. Hughley, Bill Burr, Jim Norton, Jon Reep, Bobby Slayton, Shaun Jones, Aries Spears, Bill Bellamy, Corey Zoo Miller and Craig Robinson. You definitely want to catch this guys show; insiders say hes one to watch. The best way to describe Drews act, well he’s just a natural.